Crotalus atrox is a venomous pitviper species. Males become much larger than females, although this difference in size does not occur until after they have reached sexual maturity. The color pattern generally consists of a dusty-looking gray-brown ground color, but it may also be pinkish-brown, brick red, yellowish, pinkish, or chalky white. This ground color is overlaid dorsally with a series of 24–25 dorsal body blotches that are dark gray-brown to brown in color. The tail has two to eight (usually four to six) black bands separated by ash white or pale gray interspaces. Juveniles will have plenty of space in a ten gallon tank. An adult C. atrox should have enough cage to allow it to stretch out and not overlap itself. An enclosure with a footprint of 1.6 x 0.6 x 0.5 meters (5.2 x 2 x 1.6 feet) would be fine. Branches can be used in the furnishing of the enclosure, however the snake will stay on the bottom most of the time. Hides should be placed on each end of the enclosure to provide the snake with a sense of security as they thermoregulate. Bigger bark pieces or stones put together to a cave can provide the snake the hide spot it needs like in the wild. If you want to keep them naturally, the substrate should be different sizes of sand and small sized gravel. At best 0.08-0.1 meters (0.25-0.3 feet) deep, cause they do like to dig here and there (mostly pushing their heads through the sand, but even that should be possible). It is recommended to provide a natural light pattern that mimics normal daytime according to the season. There should be a thermal gradient in the cage, so that the snake may choose the area of the cage where it is most comfortable. The basking spot in the cage should be between 32-35 °C (90-95 °F), while the cooler side of the cage should be between 24-27 °C (75-80 °F). It is extremely important that the snake is provided with this thermal gradient so they can escape the heat, if it is not provided, your pet may suffer from heat exhaustion and possibly die! At night there should be a slight drop in temperature, preferably of about five degrees Celsius (ten degrees Fahrenheit). This will help promote certain natural behaviors for the snake, and will also help to recreate the natural drop in temperature that the snake would experience in the wild. A heat lamp of appropriate wattage or heat pad should be all that is needed to heat the enclosure. We simply use a heat pad on one end of the cage to provide the proper gradient. The use of thermometers and or temp guns are highly recommended to ensure proper heat gradients. If you choose to use a heat light be sure to place it on one end of the tank and not in the center. By placing it on the end you ensure a hot spot and a cool spot. Starting November, for hibernation purposes, I start lowering the ambient temperature gradually (November -> 18-30 °C (65-86 °F), December -> 14-24 °C (57-75 °F), January and February 10 °C (50 °F)). Around March-April I slowly slowly raise the temperature back to normal in a period of 10-12 days. As an alternative to summer/winter photoperiod I also had success with switching them off lighting and having them in the dark for the winter months. Despite Crotalus atrox from arid zones are accustomed to live long dry seasons, in captivity a small bowl with fresh water should always be made available. When changing the water bowl I personally use a restraining tube as a guide. I open just few inches the glass door of my enclosure, put the tube in the water bowl and pour water through the tube. Crotalus atrox require low levels of humidity (30%). Feeding is straightforward. 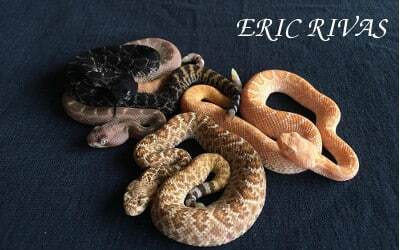 The rodents should be of an appropriate size relative to that of the snake you are feeding. You should feed neonates frequently to ensure rapid growth. A fuzzy or hopper or two twice a week is a good regimen for neonates. For adults 1 or 2 appropriately sized rats once a week will suffice. During hibernation I don’t feed my snakes. We recommend feeding be done in an enclosure other than what the snake lives in. By doing this you reduce the likelihood of an aggressive feeding response when you open it’s cage. The feeding container can be bear bottom to ensure that the snake only swallows its food and not any bedding which can lead to a mouth infection or an impaction in the stomach. However, considering the dangers of moving this snake from it’s enclosure to a feeding tub on a weekly basis puts the keeper at a higher risk of a bite; this should be done at your own risk and discretion. On occasion, neonates and wild caught animals may be difficult to initiate feeding, however once they accept their first meal they normally continue to feed well from then on. To entice a reluctant snake to feed try placing the animal in a restricted container such as a deli dish in order to keep the food and it’s scent in close proximity to the snake. Leave it alone for about 24 hours. Crotalus atrox is extremely aggressive and like other long venomous snakes, it must be handled with extreme care, always using the proper tools, mainly hooks, tongs and restraint tubes for the most basic handling. The enclosure should be spot cleaned once the snake defecates and completely sanitized once every two months. Always using the proper tools (snake hook, tongs and tubes), moving the snake to other box while the cage is completely sanitize. When spot cleaning a long stick with a Spoon at the very end, to have a kinda shovel to pick up the poo and stuff generously is more than enough and keeps you safe and the animal less stressed. We have to remember always keep a safe distance from the snake. Usually we won’t see any problems with shedding, due to the Crotalus atrox habits dried zones, but even so, we have to make sure that the snake has medium dish with fresh water into the cage so it can shed with no problem. While the cage is maintained clean, there is no potential health problems, but if the care isn’t appropriate then we can see health problems. A quarantine should always be implemented, especially if the snake is wild cut (WC). 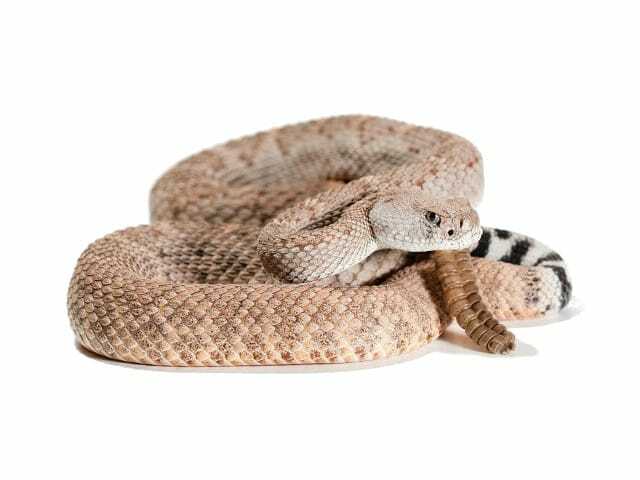 It is common with wild cut rattlesnakes that they live in the wild with large amounts of parasites in this case, the drug to use will depend of the parasites that appear in the copro analysis, there are some empirical treatments using fenbendazole at 50 – 100 mg/kg and metronidazole at 100 – 200 mg/kg in some amoebiasis cases. You should always have contact with a specialized vet for deeper information about the other drugs against parasites or other health problems.